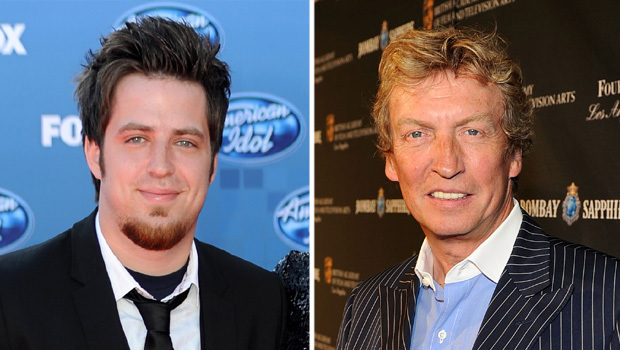 (CBS) - Looks as if last year's "American Idol" champ Lee DeWyze has fallen on executive producer Nigel Lythgoe's bad side. After Scott McCreery took the season 10 title on Wednesday's finale, Lythgoe tweeted how disappointed he was that DeWyze decided to take no part in the final show. "I was so upset Lee DeWyze wouldn't present the winner's trophy to Scotty," Lythgoe wrote. "Especially as he'd been on the show this Season. I guess he was shy." But apparently it was a lack of invitation that left DeWyze no choice but to sit back and stay out of the spotlight. The season 9 winner, who didn't perform on Wednesday's show nor received any on-camera love from host Ryan Seacrest, responded to Lythgoe's comments on Twitter, saying he wasn't asked to participate until the very last minute. "Just for the record. I was not asked to be involved in the Finale," he wrote. "It wasn't until about 2 minutes before they announced that Nigel had approached me and asked if he could 'borrow' me for a second." "I didn't feel a last second jump on stage was appropriate. It was Scotty's moment. I appreciate American Idol, and the opportunity it has given me. And the people who have made that show possible. I am not angry or bitter etc. It was an amazing Finale, and I would have loved to be a part of it. I just wasn't asked."